Usually you will want a slightly different mood for your bedroom, whether it’s to improve your sleep experience or, you know, to facilitate a lovely romantic evening. 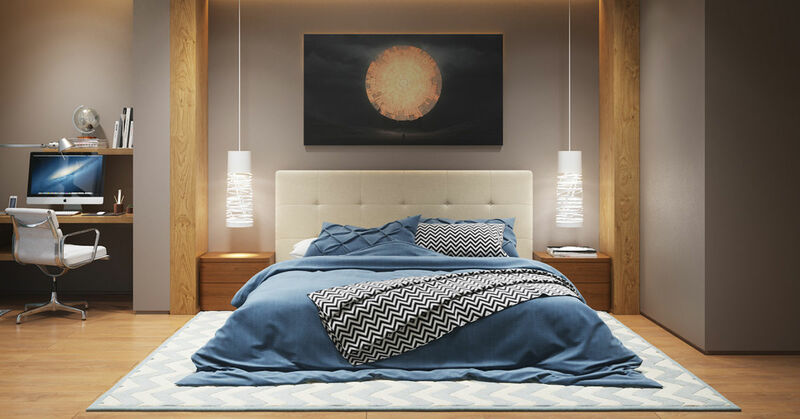 Depending on the mood you want, there are many different ways to light your bedroom. Some LED strips hidden behind a patterned glass wall or frosted glass will create really interesting light patterns at night, giving some nice soft mood lighting in your bedroom. The headboard or the back wall is a good place to add some lighting. If you have some vertical patterns on the wall, vertical light tubes or LED strips would fit right into the design for some understated lighting. Another popular lighting technique is using wide strips of coloured LED to create a perimeter around the ceiling so that the illumination is more even all over the room. A wider light source also creates a pleasant ambience while you sleep. Spot lights are very good as eye-catching point lights to draw attention to specific areas of the room. A nice extra touch would be to hang some reflective discs or medallions from the ceiling, to add glitter or sparkles at night. If you’re going for the classic vintage look for your bedroom, you can’t go wrong with some brass (or similar) chandeliers and candle stands. There are LED versions instead of actual candles, which are safer than candles. Windows are often an overlooked area of decoration, so here’s an idea: wrap some fairy lights around the window frame to decorate your bedroom for a warm glow while you sleep. The moon is actually a really bright light source, so a skylight would also do wonders in giving some free, natural lighting for you bedroom. Another variation on headboard lighting, this time with some funky artistic designs. Nice if you’re planning to have guests over and want to impress. This design features clever use of embedded LED strips in the walls, and also LED strips in the floor itself. How can you not feel pampered and elegant in such a beautiful designed bedroom? Finally, this gorgeous lighting solution wraps around from the wall and around the bed, and that angelic white light is very pleasant.